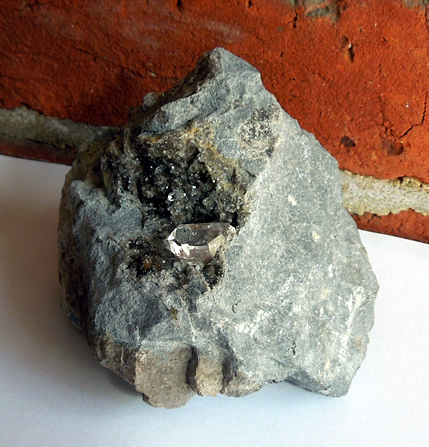 A single Herkimer quartz crystal on a baseball sized piece of dolostone (dolomite). The double terminated crystal measures 14.5x9.5 mm and has fairly good clarity. It sets on a waterfall of sparkling gray druse. The images represent the overall specimen well. Herkimer Diamonds were formed by tremendous heat 300-500 million years ago beneath a shallow sea bed of the rock dolomite, now New York state. 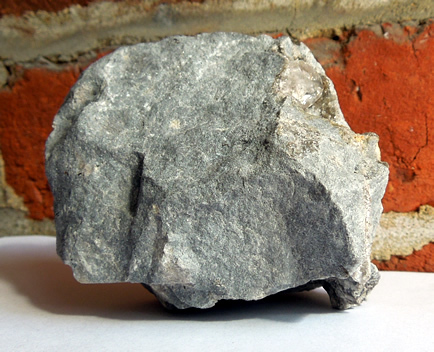 The dolomite began as limestone and calcite rock, and while still under water, magnesium was added. 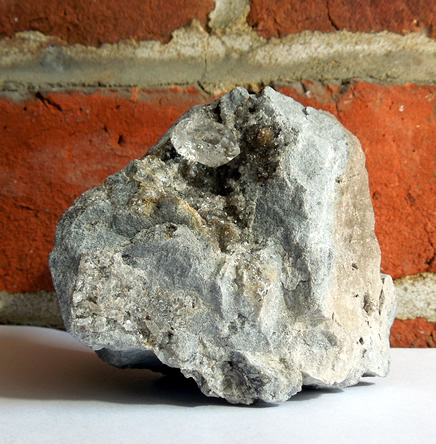 This new addition created the sedimentary rock called dolomite. Pockets and vugs within the dolomite were filled with fluid rich in silicon dioxide, or quartz, providing the material to allow the clear crystals to form. One explanation as to the double terminations points of Herkimer's is that the fluid filled pockets allowed them to form freely, providing the opportunity to terminate on both ends. Another explanation to the double termination's is silica has no attraction to the dolomite rock and avoids attachment to it. 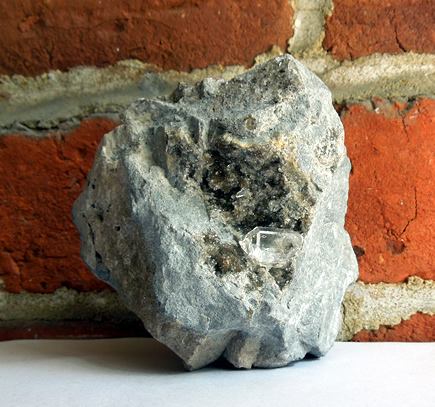 This Herkimer quartz crystal on dolostone matrix can be displayed from several angles. Herkimer quartz crystal on dolostone matrix.